At Colby we really care about your safety. We know what it takes to run a top-notch, safe workplace, and have our own NSCA 5 Star Rating and are a former "Member of the Year" with the National Safety Council. All Colby products are designed with exactly that duty of care in mind. At Colby we really care about your safety. Safety and quality are embedded in everything we do – from product design, engineering, and manufacturing through to solution development, on-time delivery and installation. Due to our comprehensive OHS system, ColbyRACK is accredited to the AS/NZS 4801 Occupational health and management system standards specification and the OHSAS 18001 Occupational health and safety management system specification. Pallet racking in Australia is covered under the Australian Standard AS 4084 Steel Storage Racking. This standard deals not only with design but also covers racking installation and operation. When buying pallet racking, it is essential that you make sure the rack system is not only designed to the standard, but is installed to the standard and is operated in accordance with the standard. That way your storage system will be compliant, safe and durable. The structural integrity of ColbyRACK is ensured through our RackMan program, a proprietary software tool developed in-house by Dematic’s world renowned structural engineers. RackMan certification is the ColbyRACK product performance badge of excellence, and means that your system will always meet and often exceed the safety standards inherent in AS 4084. Through the automated generation of RackMan certification letters, customised to a particular racking configuration, we can guarantee the load capacity and strength of ColbyRACK. Colby RackMan can be relied upon to produce rack designs that are safe, thereby protecting your staff and products giving you peace of mind, and helping you fulfil your fiduciary responsibilities. The safe racking designs generated by Colby RackMan are recorded on safe load signs attached to all ColbyRACK installations. Dematic’s engineers are experts on racking standards and are always available to discuss your individual racking needs or any questions you might have about the application of standards. The availability of imported "brand-compatible" racking in the Australian marketplace has increased over recent years. There is no shortage of generic statements and certificates from the manufacturers and suppliers claiming adherence to Australian and international standards. In some instances, published frame load capacities have been shown to be non-compliant with AS 4084. These are serious concerns for the industry. Such generic statements from other suppliers about racking standards compliance are meaningless. Our Colby RackMan tool provides certifications that are fully customised to the particular racking configuration at hand. Under the Australian Standard AS4084 2012, it is mandatory for all business to have their racking inspected at least once every 12 months, regardless of size, working loads or traffic. Colby can assist your with your regular "health" checks by auditing and inspecting your system. We will make recommendations for any damage repairs, helping you ensure compliance, and giving you peace of mind. Contact us today. Even the most careful forklift driver can have accidental collisions with storage equipment. While worst-case scenarios involving rack collapse are rare, repeated impact damage progressively weakens the structure. 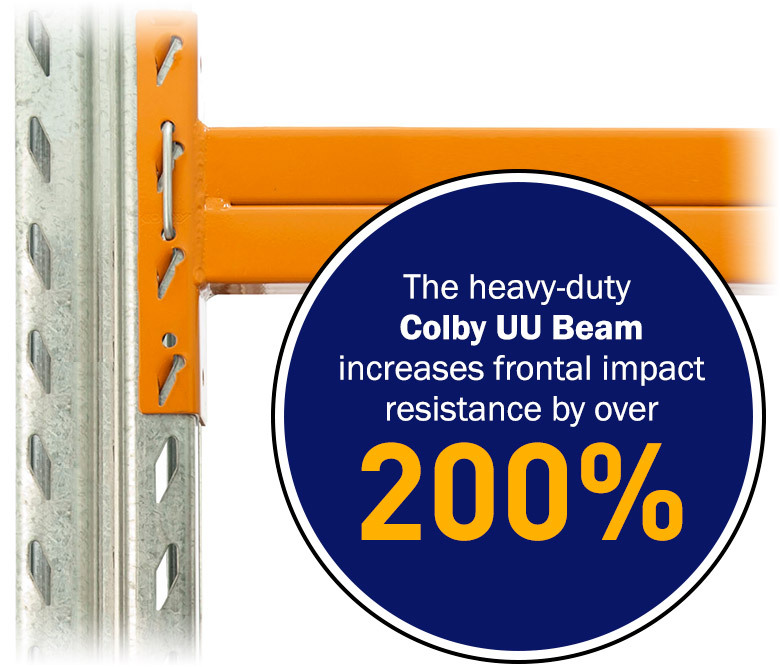 Colby's patented protection systems acts like armour for your racking, and heavy users with high throughputs tell us that this smart product dramatically reduces damage. The popular Colby Protect-a-Rack comes in a range of shapes, sizes and configurations to protect your racking investment and the safety of your staff. When one of our customers told us about the damage caused to beams by frontal impact from fork trucks, we developed a new beam with a stiffening rib in the centre of the face to help address the problem. While some may say that our patented "UU" beam is not the prettiest beam on the market, by increasing frontal impact resistance by over 200% compared to conventional box beams, it sure ages gracefully and does a great job of reducing damage and increasing safety levels. And because we designed the "UU" beam using 2 mm thick steel profiles (rolled in-house) rather than commercially available thicker RHS, the big increase in performance comes with a small increase in price. We've already presented the merits of our new Drive-in Rack as a functional system, but what many people don't know is that it's probably the best and safest in the world. Special columns, floor channels, cantilever brackets, pallet runners, bracing towers and backstops give the structure impressive rigidity and great value for money. Learn more about Colby Drive-in Rack, and find out why it is the clear market leader. ColbyRACK storage systems can be purpose-built to deal with the forces generated by earthquakes. While not a major consideration for Australian installations, ColbyRACK has been installed on numerous sites throughout New Zealand that are subjected to earthquake loading. The performance of Colby racking under seismic loading has been studied at the University of Sydney over many years, and you can be sure we get the right balance of performance, economy and robustness in our solutions.